Mr. Cafaro was born in New York City, began cello studies at age 9 in the public school system and gave his first recital one year later. He entered the Juilliard Preparatory Division as a scholarship student and later enrolled in the Juilliard School where he received Bachelor and Master of Music degrees. After graduating Mr. Cafaro played chamber music full time and served on the faculty of the University of Virginia until 1983 when he became a regular with the Metropolitan Opera Orchestra. He later joined the Baltimore Symphony and in 1985 became a member of the Philadelphia Orchestra. 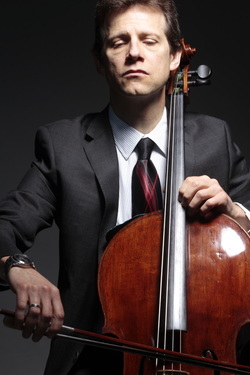 As an avid soloist and chamber musician he has performed recitals and appeared as soloist in major cities of the world, and has been a member of The Rachmaninov Trio since 2003. In addition Mr. Cafaro is passionately involved in volunteer and outreach activities for the Philadelphia Orchestra and the Saratoga Performing Arts Center, and he regularly visits schools, retirement communities and nursing homes. Mr. Cafaro’s cello was made in Venice, Italy in 1816 by Giancinto Santagiuliana. In 1999 Mr. Cafaro was struck with a virulent case of MS and was nearly blind and without the use of his hands. His doctor told him he would be on permanent disability but Mr. Cafaro has made a complete and remarkable recovery and is currently finishing a book on his journey and victory. ​Read more about Robert in our News.